Anyone from Raith Rovers looking for inspiration ahead of Saturday need only look back five years ago today when the team travelled to Easter Road in the Scottish Cup and won. Having collected just one point from their previous five league games – failing to score in any of them – this was a result, and performance, that took most people by surprise as Grant Murray’s men from the Championship knocked out Terry Butcher’s top-flight side. This was the footballing equivalent of a handbrake turn. From a bunch of deadbeats in a 1-0 defeat at Central Park the previous week, to a team of heroes all over the park in a stunning Scottish Cup win. All the missing attributes from the league games were evident in abundance. Fight, desire and belief, added to slick passing football that put the Premiership hosts to shame at times, and most important of all – goals. five-goal thriller, helped by the 1800 Rovers fans who provided the 12th man in the away end. The outcome of Saturday’s game may have been different had Ross Laidlaw not produced a superb nerve-settling save after just 90 seconds to push away a James Collins flick. Then, in the sixth minute came the moment Rovers fans thought they might never see - their first goal of 2014. Joe Cardle dropped a shoulder to leave a defender for dead before his cut-back fell perfectly for Moon, who kept his composure to find the bottom corner from 14 yards. Hibs were level in the 16th minute when Sam Stanton found space 22 yards out to fire in off the post, leaving Laidlaw with no chance, but Rovers were still giving as good as they got, despite having to reshuffle the back four after losing Reece Donaldson to injury. 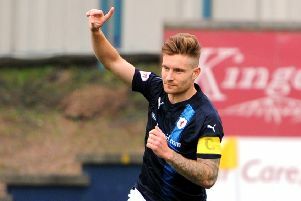 Ross Callachan was denied a first senior goal by a fingertip save from Ben Williams, who touched the midfielder’s long-range piledriver onto the post. Rovers retook the lead in the 44th minute as Donaldson’s replacement, Fraser Mullen, arrowed a free-kick into the Hibs box that found its way, via a flick-on, to Dougie Hill, who cushioned it over the line. The initial celebrations were muted as the offside flag was up, but the referee awarded the goal as the touch came from the head of a Hibs defender. Rovers would have hoped to take this lead into the half-time break but they were denied that privilege by Hibs defender Michael Nelson, who headed home a Liam Craig corner in first half stoppage time. Despite the set-back Rovers took a firm grip on the game after the break, and took a deserved lead in the 62nd minute. Cardle again provided a wonderful assist with a wicked near post cross, but Grant Anderson had to produce the header of the season to score, sending the ball flying into the top corner with an acrobatic backwards flick of his neck. Hibs threw everything they had at the Raith defence in the closing stages, but backed up by the outstanding Laidlaw, who made a number of top drawer saves, Raith’s warriors held firm to progress to the quarter-finals, where Rovers went on to lose 3-1 at home to St Johnstone. The Raith team that day was: Laidlaw, Thomson, Booth, Callachan, Hill (Ellis 73), Donaldson (Mullen 41), Anderson, Fox, Spence (Smith 64), Moon, Cardle. Not used: Vaughan, Matthews, Bates, Roberts.